This is by far the saddest post I have ever had to make on LGM. I did not know this brother personally, but we were clearly brothers in spirit and direction. He was very talented and had already amassed a long list of accomplishments. On Christmas Eve, Anthony Tolson had finished playing bass guitar at a church service and was driving to see his three kids on Detroit’s east side. Yet Tolson never made it. He was shot and killed by multiple assailants who then stole his SUV that contained his bass and gifts for his kids: William, 7; Aaron, 12, and Amber, 13. Anthony Tolson, 33, of Eastpointe, was killed in a carjacking on Christmas Eve in 2015 while driving to his family in Detroit, friends say. The suspects then drove away in the vehicle, Lewis added. No other details were released. Anyone with information about the shooting can call Detroit Police Homicide Division at 313-596-2260. 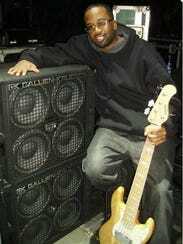 As a tribute to Tolson, Detroit bass players are holding a jam session in Southfield at Back Beat, 29555 Northwestern Hwy (near Guitar Center), at 8 p.m. on Sunday, said Kern Brantley, the current bassist for Lady Gaga. The proceeds from the concert will go to Tolson’s family. I went to the tribute at Back Beat in Southfield. The place was packed. Glad there was no Fire Marshall on site. Kern Brantley set the session up and pretty much drove the music. A lot of the local heavy hitters (I am NOT in the class)showed up and showed out. My oldest son Andrew did get to sit in for about a half our on guitar. If your are on my Facebook friends list you can see the video I posted of him playing. If you are not on my Facebook and want to be, just look for James Martin in Detroit on FB and I'll be more than happy to add you. If warm bodies packed in a room means anything, the family likely collected a good number of contributions last night. They also have a GoFundMe page set up for anyone who feels moved to contribute. This is sad. And so senseless. I don't understand how anyone can kill another human being with such callous! No respect for life. He had the car, did he have to shoot the guy??? He'll have to live with this for the rest of his life. I hope it burdens him to the point of confession!! James, I sent you a FB request. Got it and accepted it. By the way, did you notice that one of the people interviewed in the original story identified himself as DW Bass. I thought "naw....couldn't be". I did. Even had a guy on Talkbass say it was me. I didn't say anything but it is not me. I can't think of the kid's name but he's a young bassist who lives in that area. I want to say his parents were killed in a car crash a couple years back. Last name may be Wright. DETROIT - After weeks of investigations by Detroit police and tips from the public, two men have been charged in the Christmas Eve carjacking and murder of a church musician. Anthony Tolson, 33, was leaving a church service when he was fatally shot on Gratiot Avenue. His SUV, along with Christmas presents Tolson had for his three children and his bass were stolen. It was later found abandoned and torched on the city's west side. Police announced the arrests of Charles Cox, 33, and Darnell Gene-Arthur Young, 18, on Thursday. They are charged with first-degree murder, felony murder, carjacking, robbery and weapons charges. Allison Tolson, Anthony's mother, said she is relieved that Cox and Young were arrested, but is still grieving because nothing can bring her son back. "It's overwhelming. It's horrific. It's heartbreaking," Allison Tolson said. "I don't know how else to describe the agony of it all." And now justice is done. So sad that we ever had to deal with this. DETROIT (WXYZ) - One of the men convicted in the Christmas Eve murder and carjacking of a musician in Detroit was sentenced to life in prison on Thursday. Charles Cox was sentenced to life in prison without parole on first degree felony murder and other charges, according to Wayne County Prosecutor Kym Worthy. Cox and another man carjacked and killed Anthony Tolson on Christmas Eve outside of a party store in Detroit. Tolson had just left Central Baptist Church where he played bass in a holiday service.